Something to Note: I received this book from the publisher in exchange for an honest review. Why Did I Want To Read None of the Above: I knew that I wanted to read None of the Above as soon as I read the summary. I love the out of the ordinary, tough subject books and this one definitely fit that. The Characters: Kristin, our main character, was very easy to like. When we first meet her she seems to have it all, she has a great boyfriend, Sam, awesome friends, Vee and Faith, and she’s the star of the track team. But when Kristin and Sam decide to take their relationship to the next level, it leads to a string of events that will change Kristin’s life forever. Like I said, I really liked Kristin, she was such a sweet girl and she had her life planned out, she was going to college on a scholarship for track, but when she gets her diagnosis, she doesn’t know what to do anymore. Aside from Kristin, there weren’t many other characters that I cared for. I absolutely hate to see anyone get bullied, and that’s exactly what happens to Kristin once her diagnosis gets leaked to the entire school. No one seemed to take the time to understand, instead they assumed they knew what being Intersex was. They choose to make Kristin feel like a freak for being different, and that was the hardest part of this book for me. I wanted to insert myself right beside her and defend her, and maybe punch a few people. However, there were a few gems in the mix, and not everyone was treating her like she had the plague. Darren was amazing, Kristin’s dad and aunt were very understanding and they were there to help Kristin. 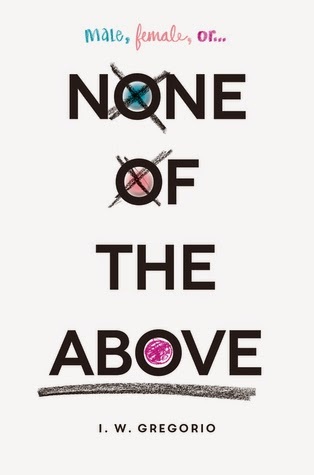 My Overall Thoughts: None of the Above is a book that should be required reading in school. It’s a book that I believe everyone should read. It shows us that there are actual people on the other side of a diagnosis, and it’s never okay to treat someone the way that some of Kristin’s classmates were treating her. Our actions and our words matter, and they affect more than just us. They can have consequences, and some of those consequences you can’t come back from. The writing was fantastic, I felt like I was right there with Kristin, and I felt the same things she did when she got her diagnosis and as she was coming to terms with what it meant. I felt that shock, that denial, the self doubt and that anger right along with her. Kristin goes through a life changing experience and I loved seeing her journey, and seeing her grow. I was rooting for her the entire time, and all I wanted was for her to see that she was still the same person, she still was the girl who loved to run, she was still the sweet girl she always was, and she still had the same dreams, she just needed to realize it. One Line Wrap Up: A touching and emotional journey about learning to accept yourself for who you are. I Would Recommend For Those: Who want something a little different. I hadn't heard of this book, but I feel like I should check it out after reading your review. Definitely a different book. Part of what makes me want to read it, to be honest, is that I'm curious how the author handles this subject, how much detail is given, etc. Great review! Wow Christy- it sounds like you really connected with this one! I'm glad to hear it was a win for you. It definitely has me intrigued and your review makes me even more so. I think I would feel the same as you- wanting to hurt people who bullied her and caused her grief…. Sigh. Kids can be so so cruel. Being a teacher myself, I think I'd like to give this one a try. Oh I am so very excited to read this book. I agree with you, its subject matter is incredibly important, and I am looking forward to it (luckily, it is up next for me). I am glad that you liked it, great review! She handles it really well 🙂 I hope you enjoy it if you read it! Exactly! And I feel like that's why there's so much teen suicide these days, kids don't stop to think before putting someone else down, either not knowing or not caring that those hurtful words can make a huge difference in someone's life. I think they should make books like this and 13 Reasons Why required reading in school. I've always been like that, I can't stand to see someone getting bullied, it irks me so bad. No one deserves that. Okay… this one definitely seems like a great book, but one that will probably be challenged. Ergo, it's my kind of a book. I'll definitely have to pick it up on my next book buying trip. I also wanted to read this book the moment I read the blurb. It was obviously extra-ordinary and had a great potential. I’m glad you like it! I hope I’d have a chance to read this. Everyone should too.